When my man and I were house-hunting we had certain criteria of what we wanted such as 3+ bedrooms, 2+ bathrooms, a garage (which we unfortunately didn't get, I curse you snow shoveling! ), sufficient outdoor space and staying in West Wellington Village. Being a hoarder collector of clothes, shoes, accessories, and anything to do with my wardrobe, one of my biggest priorities was a large closet. The house we ended up buying has a wall to wall closet in our master bedroom but I always dreamed of walking into a closet that felt like a clothing boutique. And that's how my clothes room was born. My man spent countless hours installing closet track systems in the small attic bedroom and slowly but surely the space has started to evolve. It isn't quite complete, I want it to be perfect before I show it off to the blogosphere but here is a sneak peek of some of the highlights. Do you have a special space for your wardrobe? WOW, absolutely gorgeous! I can not wait to see pictures of all of it and your floppy hats are so cute, I can not wait to see you wear them! yes, it would be nice to have a ROOM! i have a small walk-in closet that kind of doubles as my home office. look forward to the final result! Oh my gosh! This is absolutely amazing! Can't wait to see the finale with the whole room. Loving the arm candy and ring area. your wardrobe is amazing! When I buy a house that's definitely going to be one of my stipulations!!! emily, i want to go to your closet! it's so pretty. it's like a store of lovely things i could get lost in. sigh. emily, i wish i had this big a space! when your hubby finishes yours tell him to come to new orleans to do one for me! hahahaha it's nice already and not even complete yet. you LUCKY girl! i was looking at all of your stuff too. VERY NICE! you're my jewelery HERO! your room is so awesome! I have also converted a bedroom into a closet(and craft storage) but mostly closet space. I love it! I will do my best to keep it in some way or another. Umm............. I could shop in your closet. AMAZING!!! Emily! Is there such thing as "closet envy"? GOSH!!! Your selection is FABULOUS! Thank you for your fun comments on my posts. You are so happy and fun!!!!!!! girl, you ARE an hoarder for sure, hehe! that is insane how many accessories you own :O I really enjoyed those photos btw! seeing other bloggers' wardrobes and closets is always awesome. when it comes to me then yes, I have a huge closet in my bedroom and also a wardrobe which will probably expand this year. when I finish cleaning and sorting my wardrobe then I will post some photos too. Now I'm sad. I thought I had a big closet 5' x 10'. I have so much blogger envy right now!!! You should start a new blog called Emily's closet!!! I can't wait to see the finished room. The the chore is to keep it tidy! Maybe we should make you post a picture a month so we can keep an eye on you!!!! Droooool. I want this. I want this so much! I sort of have a clothes room too but it's not anything like this! You have given me ideas though! Wow! Your clothes room is fabulous!!! I'm so jealous! Oh. My. Gosh. Can I come live in your clothes room? It's beautiful! That is a seriously impressive closet! I can see many clothing montages going on in here! I just got back from 15 months of travelling so all my clothes are in poorly organized boxes and it's making me crazy! A clothes room, how awesome! 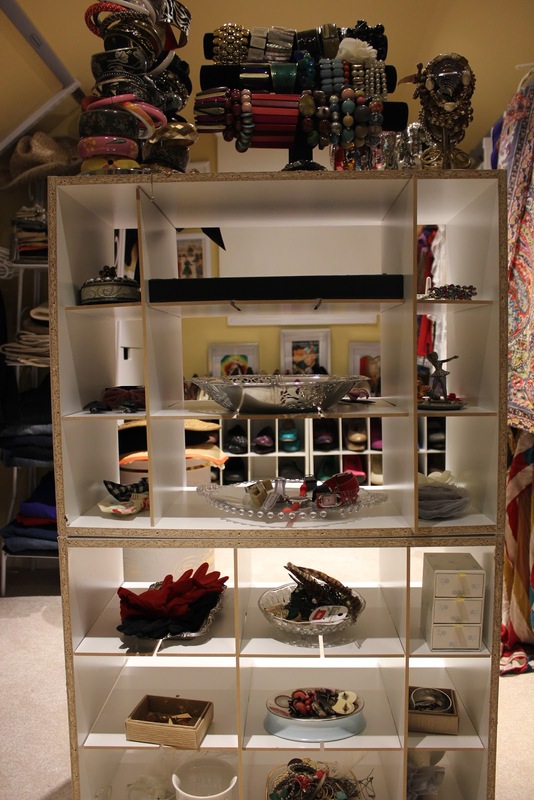 It looks like a fancy boutique too, I love how you stored everything! I am SOOOOOOOOOOOOOO ENVIOUS of your closet, Emily! I totally want to have a bigger "collection" of clothing but we just don't have the space right now. One day, though! Also, your man is AWESOME for installing all the fixtures for you. What a keeper! 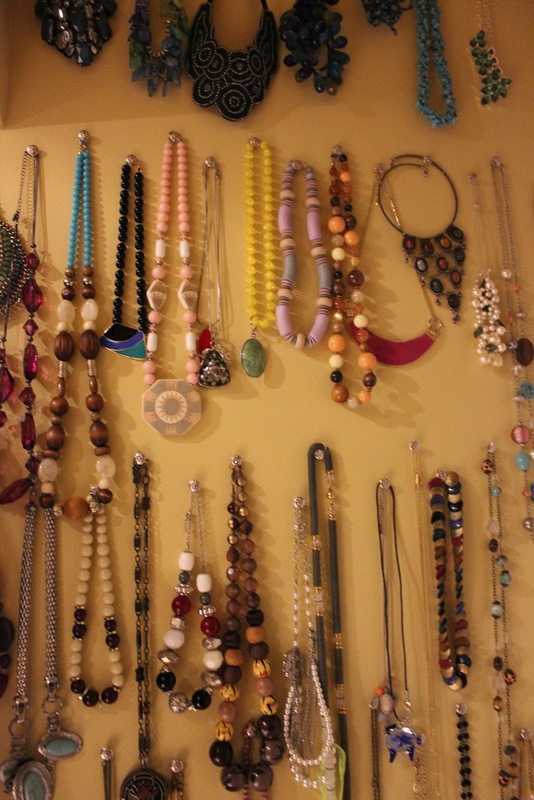 It looks pretty organised, that's some kind of necklace collection! 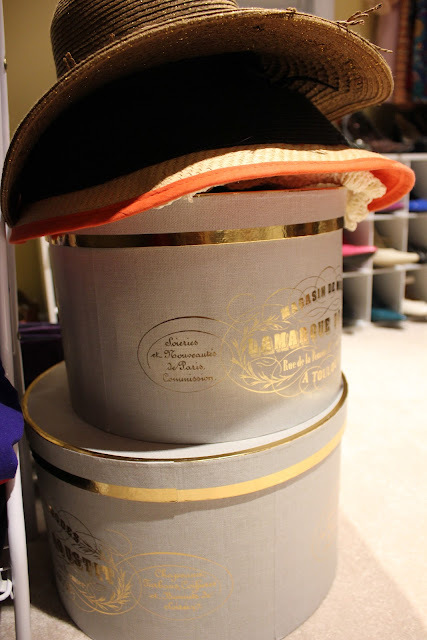 I also use hat boxes, and have a garment rack for coats that we put in the extra closet. Whoa! I'm jealous of how amazingly organized you are. I love those hats! 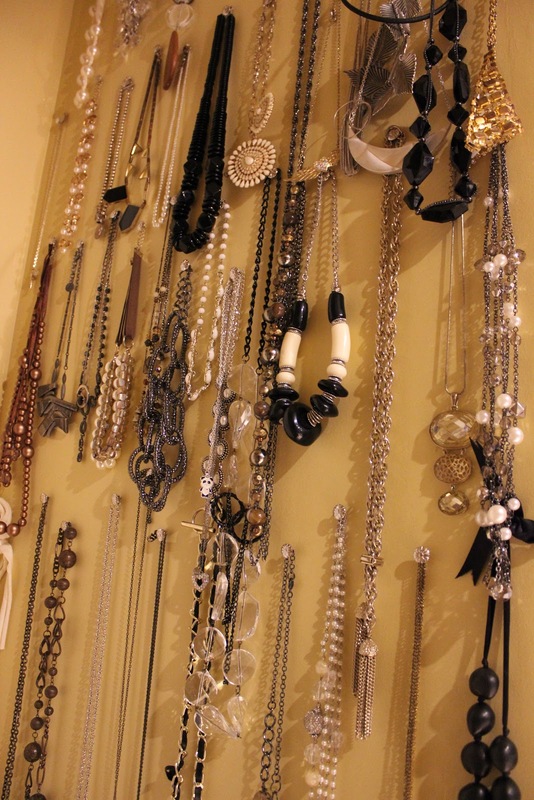 I want a closet that is like a little boutique too. So I'm very jealous of you right now. I am seriously lacking in closet space. I can't want to see your final results. Emily! Where are you? I seriously thought I had been missing your posts. Did you say something about being away for a while and I missed that? hmmmmmm? Girl! I am jelly jelly jelly! I want the official tour when its ready for viewings! I looooove it :) Those floppy hats are adorable!